Lorenzo Insigne has been one of Napoli's most important players over the years. Despite a plethora of speculation linking Italian striker Lorenzo Insigne with several European giants including the likes of Liverpool or Paris Saint-Germain, it seems highly improbable we ever see Napoli's new captain wearing any jersey other than a Partenopei one. Earlier today, Italian newspaper Gazzetta dello Sport speculated that the 27-year-old was starting to feel the pressure of the captain's armband and could be on the lookout for greener pastures at the end of the current campaign. They go on to suggest that club President Aurelio De Laurentiis could be persuaded to sell the hometown hero if an offer of over €100 million came in. A transfer fee that would not thwart off the aforementioned Liverpool or PSG. However, Insigne is the one player currently on the squad who grew up loving the club and had always made it clear that his intentions were to stay at Napoli for life, like Francesco Totti at Roma. Even back in 2015, his agent at the time, Antonio Ottaiano, said as much. “Lorenzo’s will is to stay at Napoli for life", Ottaiano declared back in September 2015. Ottaiano has since been replaced as Insigne's agent by Mino Raiola, who had once suggested that the striker should be playing for the likes of Barcelona. De Laurentiis did not react favorably to the comment at the time. “Raiola can do what he wants, but he if he intends to bring Insigne to Barcelona, he’ll have to do it over my dead body,” replied the club President when asked about the comment back in 2017. It is hard to see any of that changing now, especially with Marek Hamsik's departure from the club in February and Insigne officially being named as his successor. While Insigne has always garnered interest from across Europe, he has never wavered in his commitment to the Southern Italians. “I really hope to stay in the heart of this city so that one day, Napoli also retire the No 24." Insigne reiterated in January. He was born and raised in Naples and would feel out of place anywhere else. More than anything, he is looking to bring Napoli their first Scudetto since the days of Diego Maradona. His younger brother Roberto is also owned by the club, although he is currently on loan at Benevento. 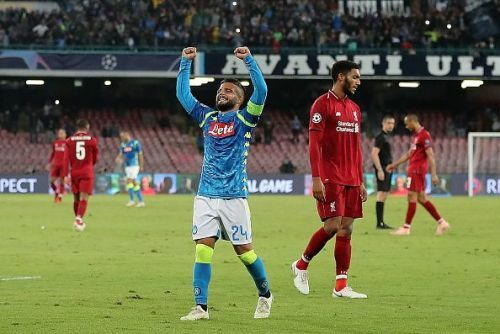 Insigne scored the winning goal against Liverpool at the San Paolo in the UEFA Champions League earlier this season and found the back of the net against PSG in both games they played against each other in the group stage of the competition as well. But it doesn't appear very likely that he will be headed back to Anfield or Parc des Princes anytime soon.